Cheap foodstuffs cause many of the diseases known to man – you are what you eat. You probably know that eating healthy food is one of the most important things today. Some time ago, eating healthy food was a privilege of the wealthy, but now that the prices of food dehydrators have gone down, everyone can afford a healthy meal or a healthy snack. The fact that you can make healthy food at home is one of the reasons why so many people are opting in for a food dehydrator, but finding the right one can be a problem. The market is full of low-quality products, which is why we have decided to review the Nesco FD-28JX. Our review will help you learn everything about the features, capabilities, and flaws of this unit. If you are considering buying a quality food dehydrator, read on, and you might find this one to your liking. The Nesco Jerky Xpress FD-28JX comes with a multitude of useful features. You can read everything about the most useful features below. With its top-mounted fan, this product produces a vertical airflow which is evenly distributed throughout the unit. Most of the stackable food dehydrators work on the same principle of vertical airflow, which is superior to horizontal airflow. One of the problems with vertical airflow is that the food flavors tend to get mixed up. If you don’t want to taste apples while eating bananas, this product will help you do so. 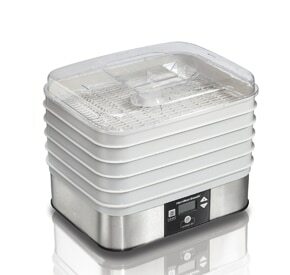 This food dehydrator comes with four wide drying trays. Each of the trays measures 13.5 inches in width – this should be more than enough to preserve a large amount of food. If you are worried that four trays won’t be enough to satisfy your needs, you will be happy to know that you can purchase three additional trays. If you choose to use seven trays in this unit, you will be glad to know that it will be enough to dry 7 pounds of jerky or a large number of vegetables. We love products which come with a large number of accessories and other inclusions. Luckily, this food dehydrator comes with a few useful additions. The first and the most useful one is the jerky gun. If you don’t have experience when it comes to drying meat, this accessory will help you get started, and it comes with three attachments. You will also receive four packs of spices – Original, Pepperoni, Teriyaki, and Hot & Spicy. This is a nice addition to an already good deal. One of the things we hate do waste our time on is cleaning our appliances. Fortunately, this unit is very easy to clean. You can safely put the pieces in your dishwasher, and they will come out clean. As always, be sure to read the manual to make sure that you can clean certain parts using a dishwasher. Another great fact about this unit is that the jerky gun comes with short nozzles, which means that cleaning the jerky gun is a piece of cake. 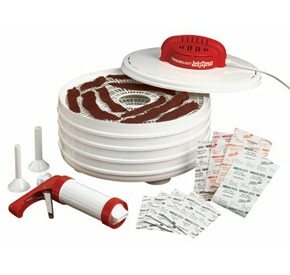 Since the nozzles are short, there shouldn’t be any meat stuck inside after you have finished preparing the jerky. Some of the users consider 350-watt heating as inadequate, but we have to say that we haven’t noticed any problems when it comes to drying foodstuffs. The Nesco FD-28JX is capable of generating enough heat for optimal results. The good thing about what some might consider a flaw is that it consumes less energy than other units. 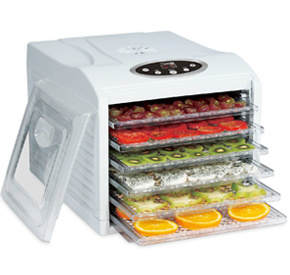 The Nesco FD-28JX Jerky Xpress Dehydrator is a stackable dehydrator – this means that you are free to add or remove trays to suit your needs. The fact that you can remove unneeded trays does wonder when it comes to saving power. We like this unit because you can set it up in a way which best suits your personal preferences. This dehydrator weighs only 4.2 pounds – this means that you can store and move this product without any hassle. The dimensions of this appliance are 14.0 x 9.0 x 14 inches. Due to the compact size of this unit, you won’t have any problems finding a suitable spot for it in your kitchen. The fact that this product lacks a thermostat isn’t a big issue. The lack of a variable temperature doesn’t mean that this unit can’t handle tough foodstuffs. Te Nesco FD-28JX is more than capable of dealing with tough food like meat, pineapples, and potatoes. We have mentioned that the fan of this unit provides a horizontal airflow. Not only will this help you combat mixing of the flavors, but it will also allow you to do other things because you won’t need to rotate the trays. When it comes to this product, there are plenty of things that we liked, but we will try to focus on the most important ones. If you have never used a food dehydrator before, you will be glad to know that you will easily learn how to operate this one. The assembly process won’t take you long, especially due to the instruction booklet being helpful. Cleaning this unit is even easier than assembling it. The only thing you need to do is check the instruction manual, and you will know which parts aren’t washable – all of the other parts can be cleaned in a dishwasher. 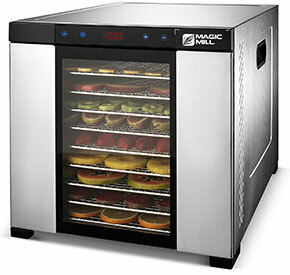 This food dehydration unit comes with a patented drying technology which helps you dehydrate food in a matter of hours. If you don’t have a lot of time to wait for the food to dry, then this unit might be the one you are looking for. If you are on a tight budget, then this product could be perfect for you. Do not mistake low price for low quality, because this product is far from being a low-quality one. Most of the modern kitchens aren’t very big, but most of the people don’t notice it until it is too late. If you have a small kitchen, you will be glad to know that this food dehydrator doesn’t take up too much space, and due to its low weight, it can be stored away when it is not in use. Every product has its flaws, but that doesn’t make it a bad product. We haven’t noticed any significant flaws, but we are going to share our findings with you. While the fixed temperature has its upsides, one of the downsides is that this product isn’t suitable for foodstuffs which require low drying temperatures. We understand that it is important to save money during the production of a food dehydrator, but we don’t like it when we are forced to purchase a separate product. If you decide to buy this appliance, we suggest that you purchase a cheap standalone timer. Yes, you can. You can even dry tough fruits and vegetables like pineapples and potatoes. Thinking about making homemade fruit leather, read our recipe. 2. Does it drain a lot of power? This product has 350 watts of heating power, which means that it does not drain a lot of power. 3. Is the maintenance time-consuming? No, it is not. Most of the components are dishwasher-safe, but be sure to read the instruction manual before cleaning this product in a dishwasher. No, the plastic materials aren’t BPA-free. 5. How hard is it to use this unit? Not at all. Even if you haven’t used a food dehydrator before, you won’t have any problems with this one after you have read the manual. The Nesco FD-28JX is one of the most affordable units out there, and it doesn’t lack quality. It provides the user with plenty of useful features, and it is very easy to use. What makes it worth purchasing is the fact that it is compact, provides a horizontal airflow, and that it has expanding trays. Nesco is one of the most famous manufacturers of great appliances, and they have proven it again with this unit. 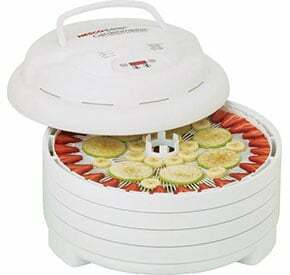 Read more about Nesco and other popular dehydrator brands. 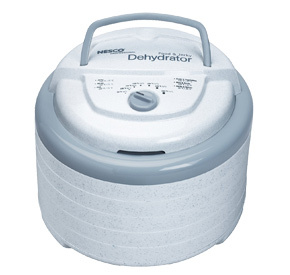 So, if you are trying to find a food dehydrator for an average family, but you don’t want to spend a lot of money, yet receive plenty, think about purchasing this one.